Talks between the government and the Labour Party will continue later, as they try to break the Brexit deadlock.No 10 said ministers had contacted the opposition and "technical" discussions would take place on Monday evening.The BBC's Laura Kuenssberg said the government had sent a document to Labour outlining its latest position.Sources indicated the PM had not accepted Labour's customs union demand, but there was a move towards changing the non-binding political declaration.EU chief Brexit negotiator Michel Barnier met Irish Taoiseach Leo Varadkar in Dublin and told reporters he hoped the UK's cross-party talks would "produce a positive outcome". But he said that, if the UK left the EU without a deal, "we will not discuss anything with the UK until there is an agreement for Ireland and Northern Ireland, as well as for citizens' rights and for the financial settlement". The EU would "stand fully behind Ireland" regardless of what happens with Brexit, he added.Meanwhile, the House of Lords is continuing to examine a bill brought by Labour MP Yvette Cooper, which aims to force the PM to request a Brexit extension rather than leave the EU without a deal. Laura Kuenssberg said ministers had reportedly suggested offering a guarantee that any deal with Labour could not be undone, creating a "lock".This would aim to ease Labour concerns that any promises could be unpicked by the next Conservative leader.But our political editor said there was "deep concern" on the Labour side that any legal promise could be undone by further legislation. Meanwhile, the prime minister was warned by members of the 1922 committee of Conservative backbenchers that agreeing a customs union in Brexit talks would be "unacceptable".The MPs met Mrs May in Downing Street and it is understood they were more open to the idea of a customs arrangement which would allow the UK to do its own trade deals.Talks between Labour and the government began last week, with Mrs May saying only a cross-party pact would see MPs agree a deal in Parliament.If no compromise can be reached between the parties, Mrs May has committed to putting a series of Brexit options to the Commons and being bound by the result. 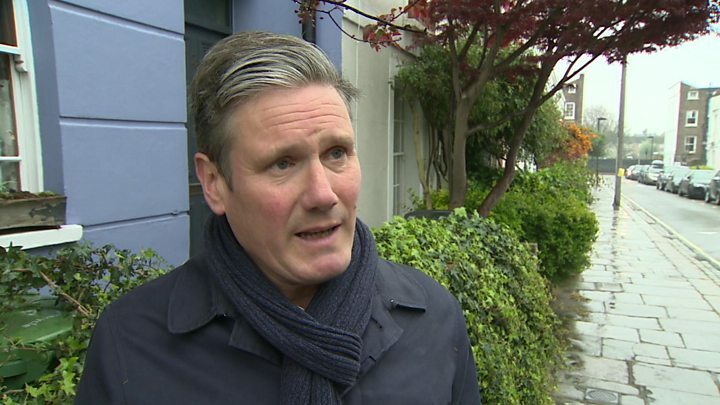 Starmer: "We haven't seen change of Brexit position"
Earlier, shadow Brexit secretary Sir Keir Starmer said the talks had been taking place "in good faith" and that "both sides... have approached this in the spirit of trying to find a way forward". He said Labour were waiting to see what the government were proposing. "All they have done so far is indicate various things but not to change the political declaration [the non-legally binding document setting out the UK's future relationship with the EU], so the ball is in the government's court. "We need to see what they come back with and when we do we will take a collective position on that." Mrs May's spokesman said she was making calls to other European leaders from Downing Street on Monday afternoon and would meet German Chancellor Angela Merkel and French President Emmanuel Macron on Tuesday.The PM is due at an emergency summit in Brussels on Wednesday, where EU leaders will expect to hear fresh plans ahead of the UK's scheduled exit date - Friday at 23:00 BST.Mr Varadkar told reporters he was open to extending the Brexit deadline to allow discussions to "continue their course".Dutch Prime Minister Mark Rutte tweeted that he had spoken to Mrs May and they had agreed to speak again on Wednesday morning ahead of the EU summit. "Crucial to know when and on what basis UK will ratify the withdrawal agreement," he said. 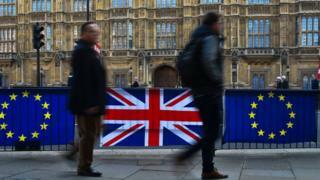 Although 12 April remains, in law, the date the UK will leave the EU, Mrs May has already requested that be rescheduled until the end of June.BBC political correspondent Vicki Young said if EU leaders did not think she had a credible plan to get Parliament behind a deal, they might refuse or insist on a much lengthier extension to the Brexit process.